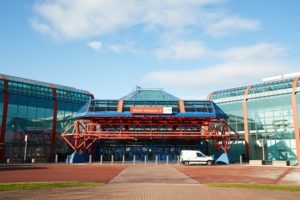 Timber Expo 2017 venue, Birmingham NEC. Image by Monkey Business Images (via Shutterstock). In just over a month’s time, UK Construction Week is upon us. For our industry and allied trades, it is a chance to show off our latest wares, whether state-of-the-art power tools or the latest in MDF related products. Almost at the halfway point of next month is the 2017 Timber Expo. Over a three day period from 10 – 12 October at the Birmingham NEC, this year’s event will (more specifically) be a showcase for our industry. There is free admission for the Timber Expo, but you need to register for any of the three days at the NEC. Your ticket also includes free admission to the Surface Materials Show. It is hailed on its website as a ‘must visit’ event for timber merchants, architects, and housebuilders. Whether you are designing a shelf or a semi-detached house, there are representatives from leading builders, timber merchants, architects, and retail partners. Also academic institutions and government departments. If you click this link, there’s an impressive roll call of attendees from the 2016 event. There is still time to register between now and the event, but register as soon as possible to avoid disappointment. Birmingham NEC is in an unrivalled position for its visitors, whether you wish to drive, take a train, or take a plane. Birmingham Airport has a wealth of non-stop flights from Dublin, Edinburgh and Belfast. Birmingham International railway station has direct trains from Manchester Piccadilly, Birmingham New Street, and London Euston stations. Timber Expo isn’t the only exhibition on between the 10 to 12 October; there are eight other exhibitions including the Surface Materials Show. These include exhibitions for: Smart Buildings; the Civils Expo; HVAC 2017; Plant and Machinery Live; Energy 2017; and, for the DIYers in mind, Grand Designs Live. The last named event, is a spin-off from Kevin McCloud’s popular home improvement show on Channel Four. Theo’s Timber, 05 September 2017.